Introduced in 1949, the Reynolds Contempora trombone features the same bronze alloy bell that make the Contempora trumpet and cornet models so distinctive. But where Reynolds’ trumpets and cornets are related to the H.N. White small brass that Foster Reynolds designed, e.g. the King Master cornet, the Contempora tenor trombones have more in common with F.E. Olds’ trombones than the King trombones produced by H.N. White. Like the Olds Super model, the Contempora tenor trombone features a nickel-silver tone ring, or “kranz”, around the edge of the bell flare. The tone ring helps focus and project the sound without breaking up at louder volumes. Both manufacturers share similar bell bracing patterns as well, with a distinctive triangle-shaped ferrule that was patented in 1938 by Reginald Olds. 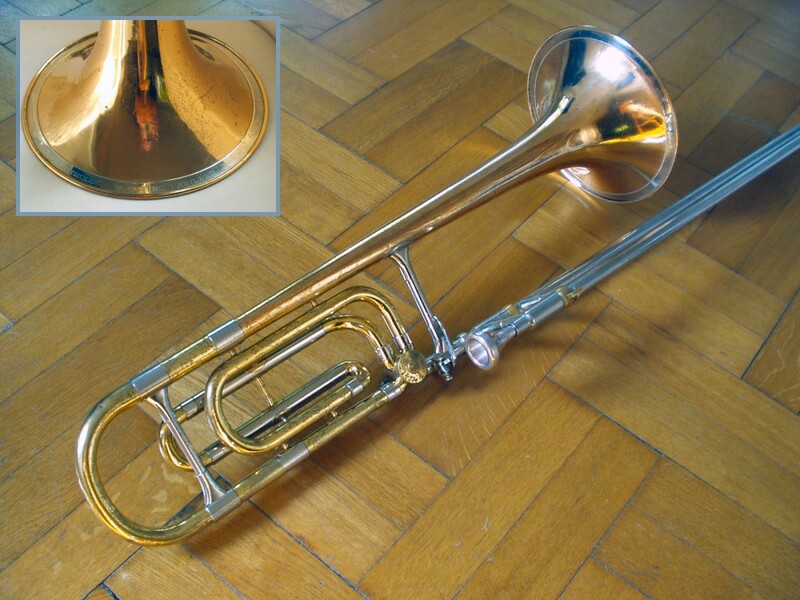 The larger-bore Contempora tenor trombone was available with a rotary valve and F attachment beginning in the mid-1950s. 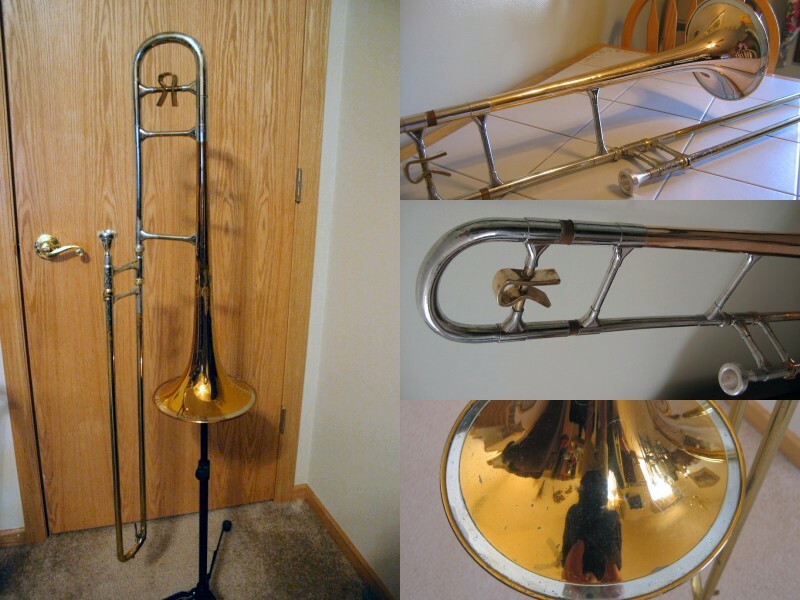 After Reynolds merged with Olds in 1964 and production moved to the Olds plant in Fullerton, the Contempora tenor trombone was offered in a single .515” bore size, with or without the F attachment. There were a number of changes to the Contempora design after CMI sold the Abilene plant to Conn and moved all Reynolds production to the Olds plant in Fullerton, CA. The counterweight changed from the long-time brass “R” to a rectangular “reynolds” piece. The nickel-silver tone ring disappeared when Reynolds changed bell materials from their distinctive bronze alloy to standard red brass. 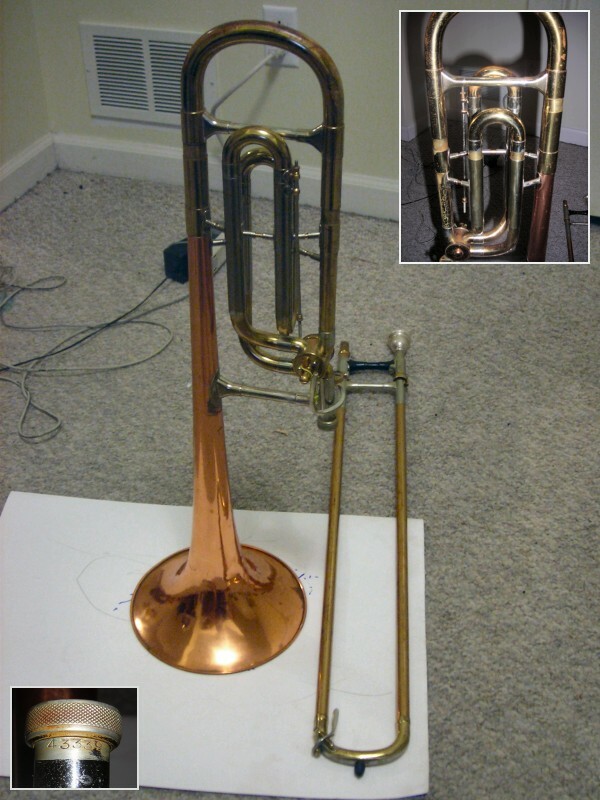 The Contempora trombone with F attachment (TO-12) disappeared from the catalog sometime between 1974 and 1977. 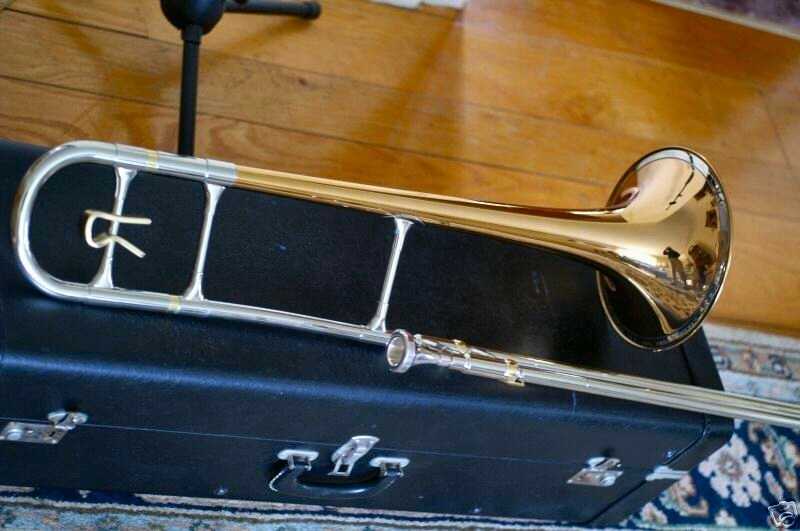 The Contempora Trombone embodies every desirable feature fine trombonists require [and] produces a superior tenor trombone tone. Slides are nickel silver, chrome-plated, drawn with one-piece stockings. Designed for beauty and rugged durability with nickel silver trimmings and Bronz-o-lyte bell. Finest metals, proper bracing and meticulous workmanship assure years of performance pleasure without costly maintenance. Rich, full, responsive tone — superb intonation — excellent ease of playing. 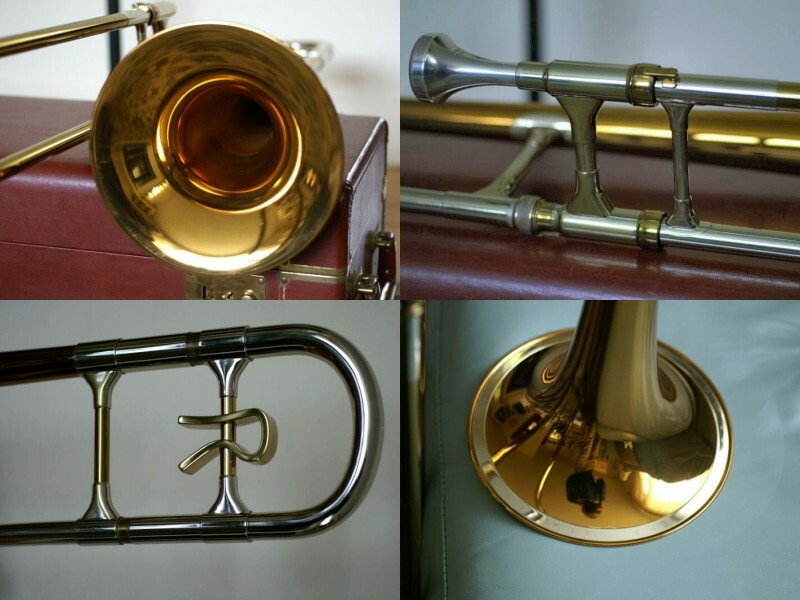 These remarkable qualities are embodied in our popular Tenor Trombones with F attachment and it is, therefore, that Roth-Reynolds also leads in this category. Top artist quality with all the features that please professionals. Large bore; 8½” bell of special bronze alloy. [The TO-12 is the] same as model TO-11 but with an F attachment that both extends lower range and increases slide facility. Top artist quality with a large straight bore for maximum volume of sound. Bronz-O-Lite bell flare has a distinctive nickel-silver tone control band which centers and projects the tone. Bore measures .515; 8½” bell. The Contempora TO-12 is the ultimate in F attachment trombones. The F attachment extends the range, while increasing slide facility. This distinctive instrument features a Red Bronze Bell. Solid Nickel-Silver outer slide and Tone Ring, with .515 Straight Bore. The TO-11 is acoustically designed to allow a fuller sound with improved response and flexibility. Top artist quality with a large straight bore for maximum sound and tone projection. High and low tone center equally. 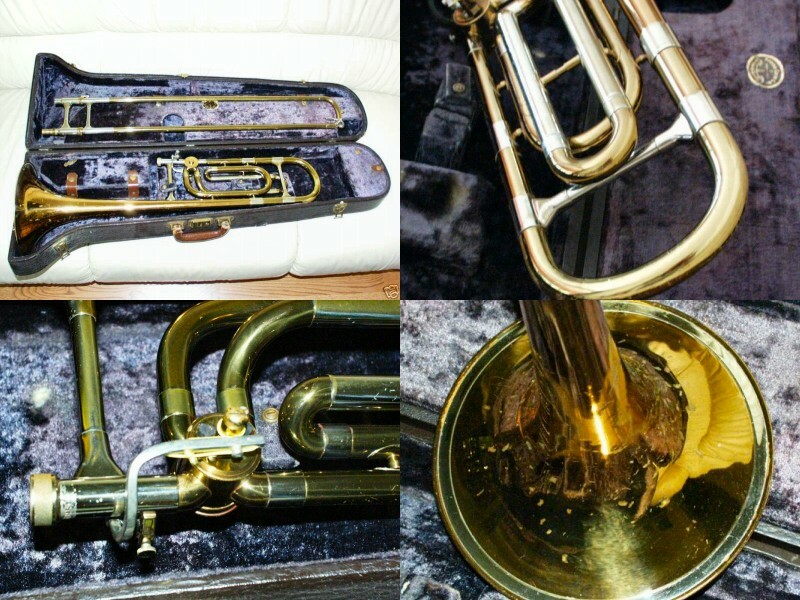 Tony Herrara sent in photos of this unique Contempora trombone, which has a tenor trombone sized bell (8½”), but features the F attachment of the “Philharmonic” bass trombone with the dual tuning slides for F and E tuning (to enable the low C and B notes). The engravings also match the bass trombone style, but Tony was clear in his note about the bell size and his description of the mouthpiece receiver matches the note below. Contempora tenor trombones seem to have a non-standard mouthpiece receiver size of .495″ (.020″ larger than a standard Bach), causing small-shank trombone mouthpieces to insert slightly deeper than in trombones with a standard receiver. Played “as is”, this can affect tuning and response, especially in the higher registers. 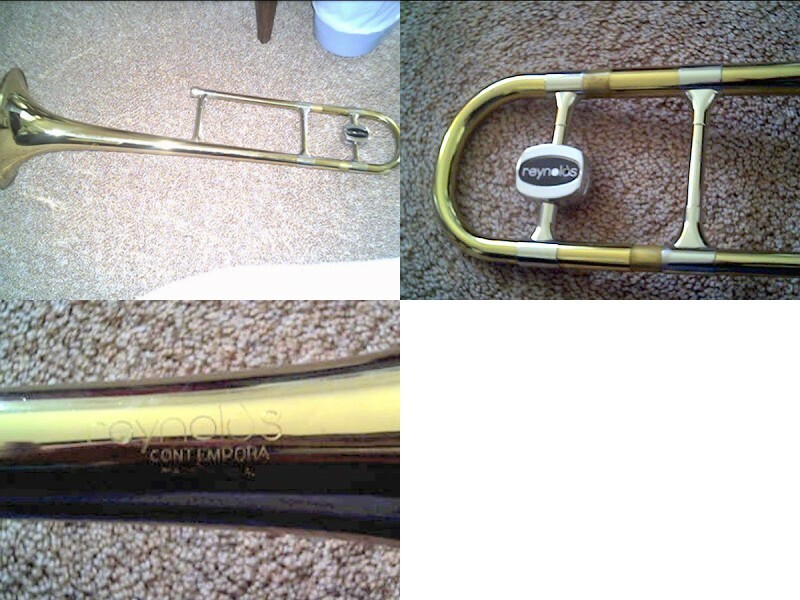 I have an example of a “Roth” trombone mouthpiece that appears to be the proper size for the Contempora; there have also been conflicting reports as to whether some of the “medium shank” euphonium mouthpieces fit properly. The most convenient solution is to add plumber’s teflon tape (or some other waterproof tape) around a standard small shank until the desired fit/insertion depth is achieved with respect to tuning and overall response.